Well we’ve certainly upped the ante here at Battle of Bosworth, as we now make wine from 2 regions, one of which is overseas. 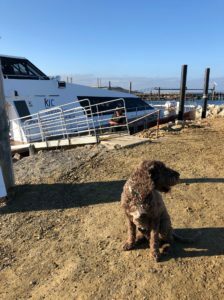 Well, it’s Kangaroo Island, but you still have to negotiate Backstairs Passage (that expensive and often wild stretch of water between Cape Jervis and Penneshaw) to get to the vineyard. This requires planning and $$$$! You can see Oscar waiting for the KI Connect Fast Cat. He’s on his way to do a couple of days of cellar door work at Springs Road. He’s always organised is Oscar. Joch, Woody and Spencer are over at the moment to pick the KI Shiraz. Our KI vineyards seem to run about 2-3 weeks behind McLaren Vale, with their cooler nights and longer growing season. This suits us just fine; we don’t want all the fruit coming in at once, as Kirk in the winery would have a melt down! 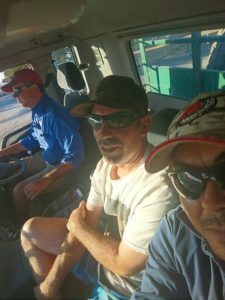 We have to bring a fair amount of equipment over to harvest in KI, including bins (To pick into) and a tractor to do ‘pick up’ – which means it drives in the vine row next to where the harvester is picking and collects the grapes. 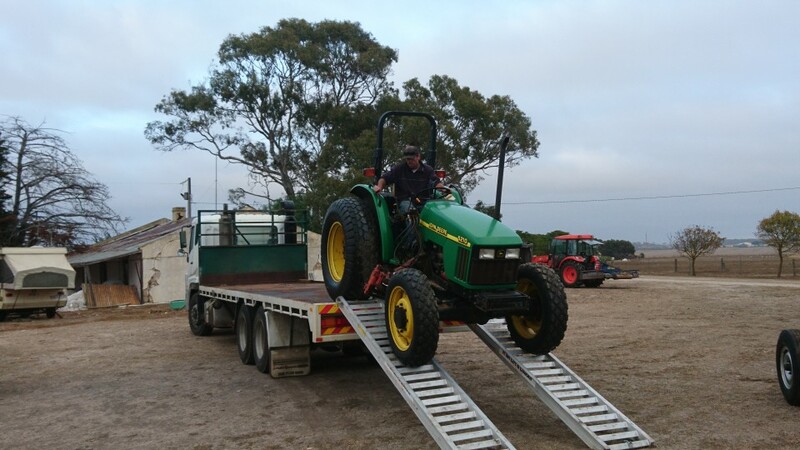 No-one was keen to drive the tractor down the ramp off the truck – it’s steeper than it looks. Well done Woody! Spencer wasn’t game apparently. 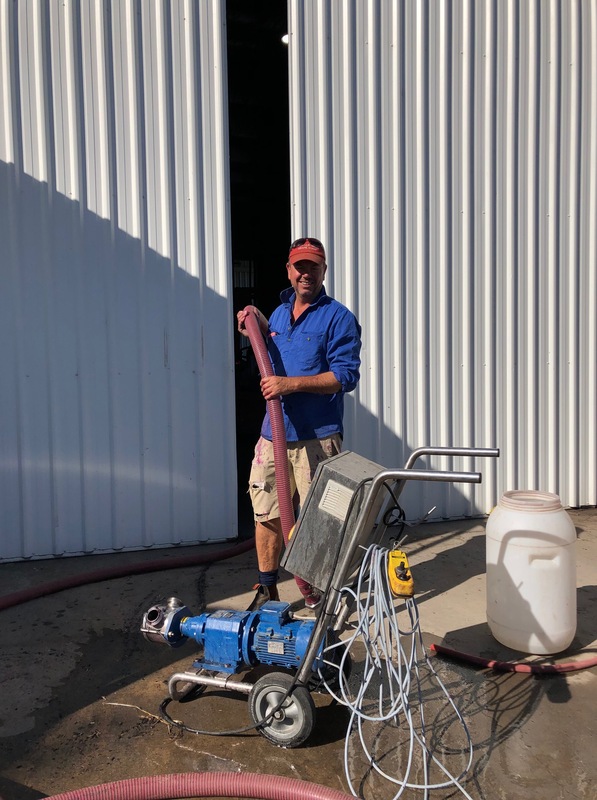 When the red wine grapes get to the winery, whether from KI or our Willunga vineyards, they all go through a fairly standard (and old-fashioned) winemaking process. 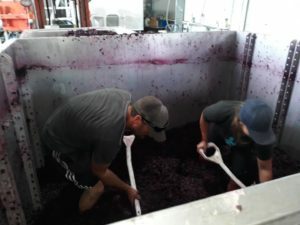 They go through the crusher, and then are fermented in small open vessels. Pump overs occur twice or sometimes three times a day, where the fermenting juice/ wine is drained off the skins then pumped over the ‘cap’ of skins to get as much flavour and colour out of the skins. You can see Joch on his birthday doing pumpovers. Onya Bozzie! Once fermentation has just about finished (the part where the grape sugar turns to alcohol) the wine is pressed off the skins and transferred to barrel to finish off fermenting. Then some poor sap has to dig out the skins from the open vessel. Here are Woody and Beatrice dig, dig digging! No need to go to the gym after doing this all day. The skins and seeds are then taken off to be composted and will be used later as fertilizer in the vineyard. The great cycle of life! And what have we been picking I hear you ask? Well, the usual suspects both here and on KI – Shiraz, Cabernet, Chardonnay, a little Sauvignon Blanc, a little Touriga, Graciano, some Petit Verdot, some Pinot Grigio and Mataro (or Mourvedre). Joch has also got his own way AGAIN, and is making a small volume of early picked Semillon (a la Hunter Semillon). 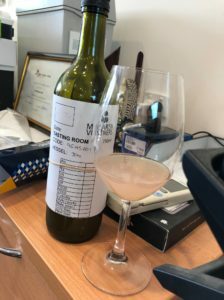 We tasted the just fermented juice recently with members of the Melbourne trade who came over with our distributors, and it tasted amazing – you’ll be hearing more about this wine later on this year. We might even do a late release of the wine. This wine will be bottled under the Bosworth label. See the prototype below. 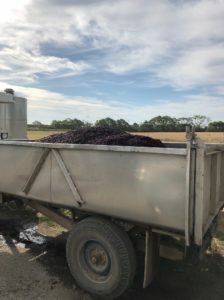 In new vintage wine news, we have the 2018 Battle of Bosworth Touriga Nacional now available. You can taste it in cellar door or buy it online. We pick our Touriga lighter and leaner than they would in its home country of Portugal where it is used predominantly for making Port (Touriga is the anchor variety). We love the bright floral characters of the variety when picked earlier and made as a dry red wine style. Well that’s all for now, I’ll do a end of vintage wrap once it’s all over, which looks like it will be well before Easter. Yippee, Easter egg hunt for all of us!